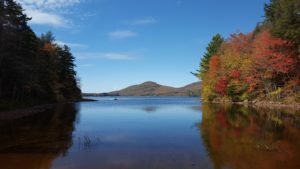 On October 13, 9 leaders and workers including myself set out for Pottersville, NY, located in the middle of the Adirondack mountains in upstate New York. Our destination: The Word of Life Bible Institute – a sprawling Bible college campus on the edge of a picturesque lake. We were there at the perfect time to see Fall colors at their peak. Everywhere you looked was like the most beautiful landscape painting. 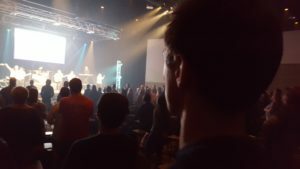 We were there to attend the Youth Pastor Summit – a 2-day seminar offered to any youth pastor or worker interested in attending for free. Free is a great price so we had to check it out. There was much about the retreat we enjoyed. We were treated to several interesting and engaging speakers who shared their experiences in working with high-school aged students. The goal of the plenary sessions seemed to be to instill a sense of mission and purpose in the leaders themselves. Brent Crowe, VP of Student Leadership University that hosted the Summit, shared his “confessions”, which were the faulty ways of thinking he had to change. These included seeing service as a means to an end rather than an end in itself, focusing too much on his own personal “brand” rather than on building God’s kingdom, and comparing himself to others. Kris Stout, VP of International Ministries for Word of Life Fellowship, preached about the need for Steward Leadership, which refers to using the spiritual gifts we are given to serve others. He used the Good Steward parable in Matthew 25 to drive the point home – it’s not our ability that makes us effective, it’s our faithfulness. Jeff Wallace, Executive Director of the YPS, preached on the leader’s integrity. We reproduce in our disciples who we are. He made a strong call for faithfulness as we engage in spiritual warfare. One of the things that struck me was the way in which the speakers preached. They had so much energy and charisma that demanded your attention. Throughout their teachings were interesting and pertinent stories that helped to connect the dots. It felt so much more than a Bible lecture. These men really cared about what they preached, and their earnestness came out strong. I realized this is something we as youth teachers and preachers need to learn to put into action with our teachings and sermons. We shouldn’t just be getting up to lecture our students on biblical truths. We should live what we preach and throw some real emotional energy into our teachings. It’s exhausting work, but that’s the way ministry is much of the time. It’s tough. It’s tiring. But the fruit makes it all worth it. Are you holding back in your teachings out of fear of how you look or apathy? This needs to change if we want to engage the youth and hold their attention. They even brought in an illusionist/pastor, Drew Worsham, who performed some truly mind-bending tricks. He was able to successfully guess cards people picked out of the deck and things people he brought on stage thought of. He had one person open an imaginary book and pick a word. Without asking any questions he was able to guess the word the person picked. He said it was all due to the power of suggestion. I thought he was then going to connect this into a teaching, but nope. That was it. I’m not really sure why he was there, but I’m glad he was. It was fun and interesting. While we got some powerful, heartfelt messages, I was struck by the fact that not much scripture was used to back up points. Most of the teachings were taken up by personal anecdotes, which are helpful for keeping things interesting but rob from the power of the message when they take away from scripture. This wasn’t the case with all the sermons, but it was interesting to see how common it was. Is there a general distrust for letting the scriptures speak for themselves that we need to craft our own message? Rather than teach from a hand-guide of effective business leadership, isn’t there enough on leadership in scripture to pull practical principles from? This is a common thing I’ve noticed at some youth groups I’ve visited. 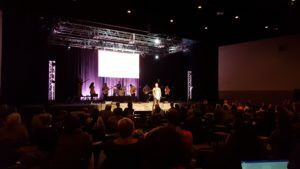 There seems to be a fear that students won’t find the service entertaining enough, so scripture is watered down and the big thing promoted is “the show”. Pastor Sam Stephens said it best: the youth don’t crave entertainment, they crave truth. Trust in the power and truth of the Word. One of the things I was looking forward to seeing was the singing worship service. At NeoXenos, we don’t even have one, so I was looking forward to listening to some good, fun Christian music. As far as I was concerned, it was a free concert. To my delight, the band they had there, called Liberty Worship Collective, was fantastic! The energy was high and it was augmented by lasers and fog machines. My fellow youth worker Ryan Yoerger attempted to add to the ambiance by blowing vape smoke everywhere, but this was met with more than a few disapproving glares. However, the music show got old for me fast. It went on forever, literally taking up more than half of the plenary conference time. When they started replaying songs they just covered in the morning, I had enough. 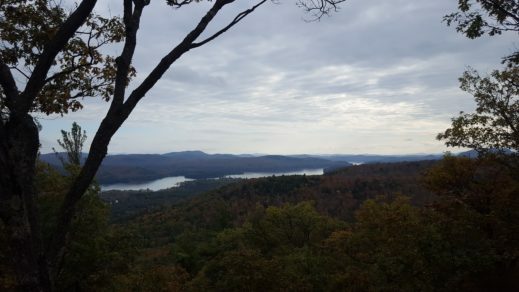 We left during the final show and decided to hike up the nearest mountain instead. 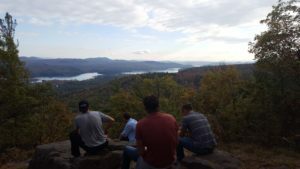 It was a tough one, but by the end we were treated to a glorious view of the Adirondacks. One of the best parts of the entire trip was spending time around the community motel fire pit at night. we met several different people from different places, including a couple guys from way across the pond in the U.K. We met a Dietitian who disapproved of my low-carb diet, and we also got a chance to witness to one of the gentlemen from Jersey, Great Britain. On the last night, we stayed up late telling ghost stories with a guy from New York City who works as a subway conductor. It was such a blast. It made me lament the fact that our culture is getting away from a true sense of community. In general, people are more isolated than ever, which makes us miss out on the joy of sharing experiences. We quickly get bored with conversations because they’re not as stimulating as our phones. In all, the conference was an incredibly edifying experience. It brought out many ideas and convictions we took home to our high school groups, and I am so grateful to SLU for offering this conference for free. Thanks for sharing your thoughts and insights regarding the conference. What an awesome opportunity to meet new people and listening to some gospel music. Looking forward to reading the next adventure.